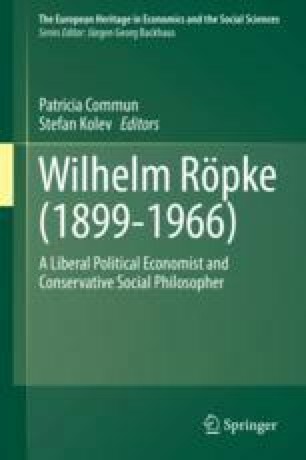 Schneider emphasizes that especially in A Humane Economy, Wilhelm Röpke’s distrust of the market is compensated for by his trust in culture. This can be contradictory, given Röpke’s general cultural pessimism. Röpke trusted the market as an organizational principle, but he dismissed assigning to it the main role in organizing society. For Schneider, Röpke very specifically meant bourgeois culture and was optimistic about this particular culture. However, Röpke left open questions: Was there ever a bourgeois culture? By which (epistemic) criterion did he assign this leading role to it? Could his appreciation of freedom clash with his appreciation of culture? Schneider finally claims that if Röpke had recognized the market as a process, it would have been much easier to reconcile market and culture.